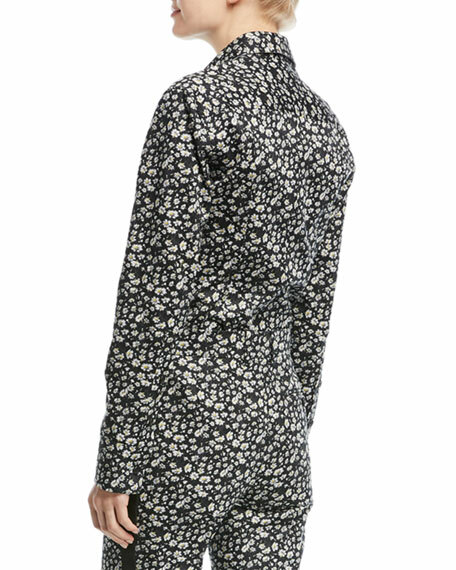 CALVIN KLEIN 205W39NYC top with daisy floral-print. Anatomie "Hazel" velvet and mesh top . Approx. 24.5"L down center back. V neckline with halter illusion; cutout shoulders. Long sleeves. Slim fit. Polyester/spandex. Machine wash. Made in Italy. Model's measurements: Height 5'10"/177cm, bust 33"/84cm, waist 25.6"/65.2cm, hips 35.8"/91cm, dress size US 2-4/FR 34-36. DL1961 Premium Denim "Christy" shirt. Spread collar; button front. Short sleeves; roll cuffs. Left chest pocket. Easy silhouette. Tie-front hem. DL1961 Premium Denim "Christy" shirt. Spread collar; button front. Short sleeves; roll cuffs. Left chest pocket. Easy silhouette. Tie-front hem. Tencel® lyocell/linen. Machine wash. Imported. 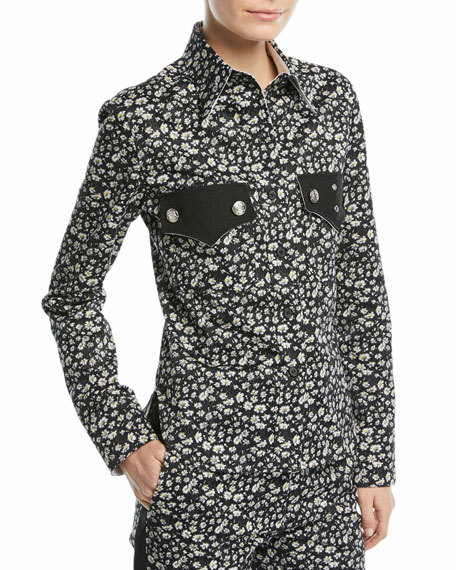 Elie Tahari "Martha" blouse in metallic floral devoré. Spread collar; button front. Long sleeves; button cuffs. Classic silhouette. Inverted back pleat. Silk/viscose/Lurex® metallic. Dry clean only. Imported. Model's measurements: Height 5'10"/177cm, bust 33"/84cm, waist 25.6"/65.2cm, hips 35.8"/91cm, dress size US 2-4/FR 34-36. Jonathan Simkhai blouse with ruffled lace trim. High neckline; button front. Long sleeves; bell cuffs. Relaxed fit. Silk. Imported. Model's measurements: Height 5'10"/177cm, bust 33"/84cm, waist 25.6"/65.2cm, hips 35.8"/91cm, dress size US 2-4/FR 34-36.